Don't blame us for slow streaming, Netflix says—at least, not until you run this test. Netflix’s Fast.com utility makes its war against poor speeds from Internet service providers(ISPs) very personal. The popular video streaming service's web-based tester can tell you the download speed from your home to Netflix servers. Fast.com is dead-easy to use. Just point your browser at fast.com, and Netflix takes care of the rest. After a few seconds you should have your general download speed between you and the closest (presumably) Netflix server. If you want to get an updated measurement, just hit the refresh arrow. Fast.com will work on any device with a modern browser, including PCs, smartphones, and tablets. An example of the Fast.com results page. Netflix said its aim with Fast.com was to offer an easy-to-use website that’s open to anyone worldwide. That’s why you won’t find all the technical details you can find on other Internet speed tests such as ping, jitter, or even upload speed. The site also doesn’t have an option for choosing a Netflix server location to test. All of those data points are irrelevant to consuming Netflix, and arguably too technical for the average user who just wants to know their download speed. 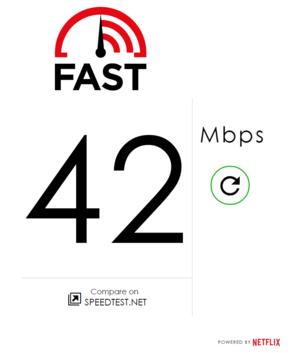 For a more detailed look, Netflix helpfully provides a link to Speedtest.net on Fast.com. Speedtest attempts to test your Internet connection based on a test server that is closest to you. For most users there shouldn’t be a huge difference between the Speedtest and Fast.com results; however, users in remote areas or overseas may see dramatically different scores. The impact on you at home: Fast.com is Netflix’s second tool to help users understand what kind of speeds they can expect between their home and Netflix servers. Netflix also publishes a monthly ISP speed index that lets you see the average speeds of Netflix from your ISP during prime time hours. Fast.com supplements this monthly index by letting you see your actual speed at any given time. Depending on your location and equipment your results on Fast.com may be much faster than the monthly ISP index, which averages the speeds of users nationwide on a given ISP’s network.